Was the cleaning of the Sistine Chapel ceiling a crime against art? At the end of the last century, a 20-year project to clean the soot and grime off the Sistine Chapel ceiling was finally completed. In my book After Chapters and Verses, I use this cleaning as an analogy for the way The Books of the Bible similarly strips away the accumulated accretions that have obscured the original appearance of the biblical writings. It should be noted, however, that this cleaning was actually quite controversial. 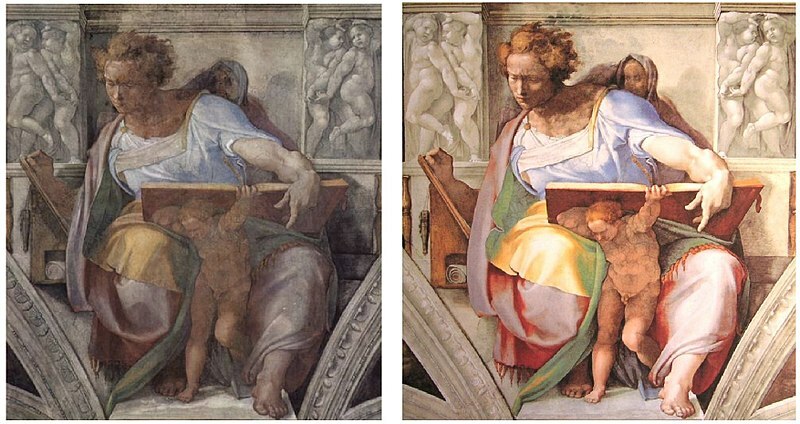 Many responded with delight and wonder to the discovery that Michelangelo’s colors had originally been so bright and bold. But others were deeply disappointed. They felt that the true art of the chapel was its frescoes as they had come to be known. They lamented that this art was lost forever when the darkening and harmonizing patina was taken away to reveal what they derided as “ice cream colors“ beneath. This same question applies to the Bible. Is the traditional Bible, like a sooty fresco by Michaelangelo, actually better off for the wear? In other words, have the chapter and verse divisions become an essential part of what the Bible now is for us today? Expressed more generally, this is the belief that the Bible is what it has become. This is actually an aesthetic commitment: that a work of art is not finished or complete in the form in which its creator releases it. Rather, it continues to grow and take on substance and meaning throughout its subsequent history as a cultural artifact. If that’s the case, then something essential to the Bible actually is lost when the shaping of later centuries is undone, as happens in The Books of the Bible. Does the full creative process include settings and adaptations introduced by later users? Do the marks of an artistic creation’s subsequent history as a cultural artifact become part of its essential substance and meaning? Is the Bible what it has become over the centuries? And if so, does that mean we should keep engaging the Bible as it has come to be known, rather than seeking to repristinate it in some way? I’ll start exploring these questions next time by considering another artistic creation that has become a cultural icon. I like the format and the removal of the verse designations and find it reveals things not seen before in my 5 decades as a christian. However, there remains something comforting to open my regular Bible up to study. The former is great for just reading, the latter almost necessary to study and to communicate the truth to others. Additionally, having now read the unformatted version, my new perspective has forced me to take more time to really read my regular Bible, searching for those things that I might have glossed over previously. Your experience is very much like that of others who have gotten a copy of The Books of the Bible. They find it’s great for reading and that the removal of the distraction of chapter and verse numbers affords them many new insights. But I’d suggest that a Bible without chapters and verses is also great for study. That’s the whole idea behind the Understanding the Books of the Bible study guides that this blog was created to support. But a new concept is required of what “studying” the Bible means: not moving back and forth between small stretches of text and outside aids such as study notes or commentaries, but recognizing where all the parts fit after first understanding the whole. (Customarily we ask people to try to understand the parts before they’ve experienced the whole.) I talk more about what it means to “study” the Bible like this without chapters and verses in my book After Chapters and Verses. In a future post I’ll give a real-life example from the book of what “studying” looks like in each case. Thanks very much for your comment, and I’m glad that The Books of the Bible is making your reading more enjoyable and helping you find more of the many treasures that are hidden for us in God’s word. Previous Previous post: Was King Jehoram’s “youngest” son not his last son? Next Next post: Would the Liberty Bell still be the Liberty Bell without the crack?